(Newser) – As investigators look into the likelihood that al-Qaeda was behind the attack on the US consulate in Benghazi last week, CNN reports that Chris Stevens, the US ambassador killed in the attack, believed he was on an al-Qaeda hit list. 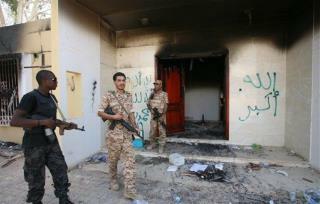 A source says Stevens had become increasingly worried about security in Benghazi and al-Qaeda's growing influence in Libya. And intelligence sources tell Fox News investigators do believe al-Qaeda was behind the attack—specifically Sufyan Ben Qumu, a former Guantanamo detainee, who was involved and may even have led the attack. Qumu was returned to his native Libya in 2007 on the condition that he be kept in custody, but was released by the Gadhafi regime the following year. Counterterrorism officials also tell the Wall Street Journal they are probing possible al-Qaeda links to the attack. let the "nice folk" at gitmo go so they can go on killing us OR FEED THEM TO THE FISH AND GET THE HELL OUT OF THERE! FUBO!